Situated on a remote hilltop northeast of Tanzania’s capital city of Dar es Salaam and with a vista of the plains below, Kisampa is a special place. So special, in fact, that some of the AfrikaAfrika team live here permanently! Kisampa is a private community conservation sanctuary that adjoins the unique coastal Saadani National Park in eastern Tanzania. Here we offer you a personal journey, an experience full of meaning – not just another destination. 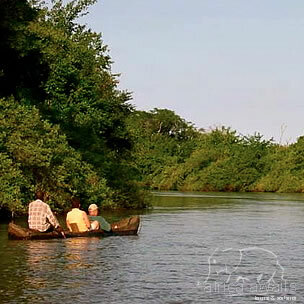 We will lead you on a superb exploration that will take you into the heart of this amazing little piece of Africa. Because it’s our own sanctuary, you won’t bump into other safari-goers anywhere on Kisampa. We keep your experience intimate and personal. This is an adventure that will get you thinking. It will stretch your mind (just as much as your legs) and Africa will get under your skin. Welcome to Kisampa - Where Africa awakens your soul! Our wilderness, eco friendly lodge is comfortably rustic in its simplicity, underscoring our desire to leave a minimal human footprint in this pristine area. The camp can accommodate only 14 guests – keeping your experience intimate. There are six thatched bungalows at Kisampa, each with a hand-crafted double bed, hammock (from which you can see endless views of the Kisampa plains) and a table with chairs. 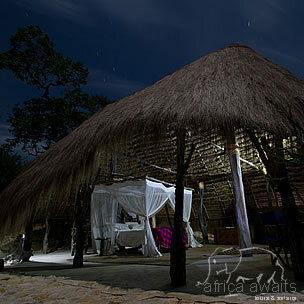 Each bungalow has its own private and unique bathroom set into the surrounding bush and open to the stars. A bush shower hangs from a tree branch and steaming hot water is delivered for bathing at your request. There's also a spacious communal bungalow for relaxing at Kisampa. Feel free to sink into the huge sofas with a drink and peruse the small but well-stocked reference library. Kisampa is quite literally a bush playground for children! For this reason we greatly encourage families to come here to experience Africa. Accommodation for children is flexible – either with the parents or in separate, nearby star-gazer tents. Mornings at Kisampa begin with freshly brewed tea or coffee deliver to your bungalow at which ever time you desire. Kisampa’s intimate size makes dining a highly variable experience for our guests. Breakfast and lunch are usually served in our open-aired Pavilion, or as picnic lunches when on longer hikes, game drives to Saadani or to Sima Beach. Evenings begin with sundowner drinks around an open fire surrounded by the vast open plans. Dinner at Kisampa (weather permitting) is served under the stars, warmed by the nearby crackling fire. We pride ourselves in using local produce, honey from our own production, freshly baked bread, wholesome soups, crisps salads and a fine selection of wines. With proximity to both ocean and bush our meals contain a wide variety of meats, seafood and vegetarian options. Kisampa does not specialise in big game watching; we see it as more of a retreat. Because we're situated in a private conservation area rather than a national park, we can do what we want, however and whenever – from walking to canoeing to camping. If time allows, we are a short drive away from Saadani National Park (a unique space due to its proximity to the coast). General game is plentiful and, combined with a Wami River Boat Safari and a picnic at the beach or under a tree in the park; it makes for a varied, interesting and enjoyable day trip. Other activities include long bush walks, beach camping at Sima Beach or bird watching from viewing platform. Finally, Matipwili village lies a few miles away, which we would encourage you to visit if you wish. The people here are only too happy to show you around. Kisampa’s setting provides the real bush experience that makes these enjoyable, professional and scientifically credible courses such high quality. The incredible atmosphere of living and learning in such a wild and unspoilt wilderness fosters a love of the African bush, and brings home to all students, whether Tanzanian or from elsewhere, what a special privilege it is to be able to live in, work in or just enjoy such surroundings. These unique and exciting residential courses are run for a minimum of four people from our secluded eco lodge or campsites. Our instructors all have a passion for Kisampa, the bush and sharing their experience and knowledge with others. They have vast experience in training and education, health service provision and guiding. All course participants receive competence or participation certificates for each course completed. Course details can be obtained by contacting us directly. These courses can be tailored for corporate clients or school or family groups, depending on the objective. Our programs are aimed at having fun and most incorporate our themes of wilderness awareness, bush survival and first aid with emphasis on confidence building, initiative, team-work, planning, communication and supervisory skills. Real life scenarios, tasks and games are conducted to reinforce the teaching points. This course is designed to give participants confidence in dealing with medical emergencies in the bush. The training is scenario based to simulate real life situations and to enhance retention of skills. Participants are taught to improvise to use equipment and resources around them to give assistance to sick or injured people. Conserve, develop, support and sustain. In essence, Kisampa is about people, with a total of 5 villages and several hundred people being involved in, and benefiting from the sanctuary. Not only do we pay a concession fee for every bed filled, but just as importantly, we buy our supplies and employ our staff from the area. ; we are a channel for fundraising to help local schools and medical facilities. Through funds raised at Kisampa for example, we have just finished building the area’s first secondary school now with over 200 students. Thirty secondary school students have full scholarships thanks to the generosity of our guests and we have helped local people develop businesses that enhance Kisampa and help guarantee their children’s future. Kisampa is in the transition zone between East Africa Savannah and Southern Miombo and hence both are featured in this stunning sanctuary. Here you will find everything from coastal rain forest, riverine forest, floodplains, coastal thicket to woodland all creating variety of flora and fauna. Kisampa has all the fauna of Saadani National Park due to our sanctuary sharing an unfenced border with the park. Uniquely we see things you don’t commonly see elsewhere - Red Duiker (common), bush pigs in big groups during the day, black and white colobus (Angolensis Colibidae). All best viewed on foot and from various platforms and hides. 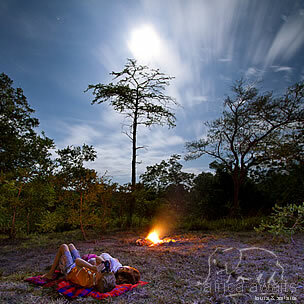 Nocturnal animals can also be seen on night drives - civet, genet, porcupines and various antelope. Taste, texture, aroma...honey.....You will simply love our pure, organic, African honey. This environmentally sustainable industry is aimed at poverty alleviation of village beekeepers whilst maintaining this pristine environment. Kisampa’s vision and goals for our beekeeping project is to see a community where Tanzanian villagers live with a high standard of living and exist in balance with the natural flora and fauna in an environment by the sustainable use of the natural resources, such as beekeeping. Kisampa acts as an education resource and collection and purchasing hub for beekeepers in all surrounding villages. We can offer a guaranteed market to community beekeepers and will pay cash on delivery of honey at an agreed and set price. This is the pivotal aspect of the project, which will allow village beekeepers to augment their income. Kisampa sells honey products generated in the area to our guests and to selected boutique outlets and actively encourages bee related tourism. With your holiday, safari or business trip from in to Kisampa in Tanzania.